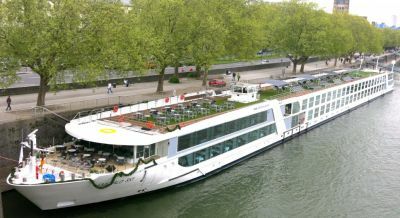 It seemed a good idea to feature Cologne as this week’s ON TOUR, one of the stops on Emerald Sky’s maiden voyage, the feature ship in Cruise News. Cologne was severely bombed by the Allies during the Second World War and some of the scars still remain, but in the 21st century it is a vibrant city and a major transport junction. Cologne/Bonn Airport, with a 24-hour operation, is the second busiest German cargo airport and with passenger flights to most European centres. Our arrival at Cologne was by the most traditional of routes, via the Rhine, Emerald Sky mooring alongside the Am Leystapel promenade (and just by the Chocolate Museum). The visit was also short, but it is one of those cities that we have marked down for a longer stay. Just like with deep sea cruises we consider the one day call as a taster. Like the place and we go back. Cologne (in German Köln) is Germany's fourth-largest city (after Berlin, Hamburg, and Munich). It is over 2,000 years old and was the capital of Germania in Roman times. It was the birthplace of Agrippina, wife of Claudius, mother of Nero and sister of Caligula (pleasant lot!). In 1248 the construction begun of Cologne Cathedral, which dominates the central area of the city, but after 200 years building effectively stopped with the towers and nave incomplete. In 1842 serious work started again and the structure was finally consecrated on 14 August 1880, 632 years after construction had originally commenced. The cathedral suffered 14 hits by aerial bombs during World War II. The towers did not collapse, but stood tall in an otherwise flattened city. The building is a most impressive structure, 474ft long, 284ft wide and its twin towers approximately 515ft tall. By comparison St Pauls Cathedral is 518ft long, 246ft wide with a height of (only) 365ft. 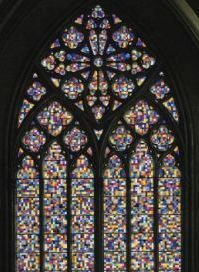 In 2007 Cologne Cathedral received a controversial new stained glass in the south transept window replacing one destroyed in the war. With 1,220sq ft of glass, the window was created by the German artist Gerhard Richter and manufactured in the UK. It is composed of 11,500 identically sized pieces of coloured glass resembling pixels, randomly arranged by computer, which creates a colourful "carpet". The Archbishop of Cologne, Cardinal Meisner, refuses to acknowledge it and sits with his back to the piece. His choice would have been 20th-century Catholic martyrs. Entry is free. For a major city Cologne is not that large (about one million population). For a quick introductory tour once again the open top bus is the answer. It takes about 1hr 30mins to cover the entire trip without breaking your journey and covers both sides of the Rhine. 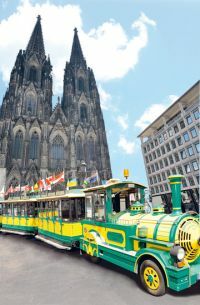 For the children the Bimmelbahnen mini-trains are perfect, the Zoo Express starting at the Cathedral square routing down the Rhine Promenade to the Cologne Zoo, the Rhine cable car station and the “Flora” Botanical Gardens and back. Another very good alternative is to join an official guided tour of the area around known as the ‘Old Town’, cobbled alleys and market squares plus the heritage of Eau du Cologne (the Farina Fragrance Museum – a tour of the building includes a sample), first made-up in 1709, and of course the Chocolate Museum another one for the children (tasters are part of the package). The ultra-modern building overlooks the river which extends over three floors and takes you on a journey through the 3,000 year history of chocolate – from "the food of the Gods" for the Aztecs to a modern industrial product. The most popular shopping street is the Hohe Strasse, a sort of narrow Oxford Street busy and pedestrianised and full of trendy boutiques and coffee bars and many well-known names from English high streets and shopping malls. In the midst of it all we discovered a huge computer shop called Media Markt (all what was wanted was a €6 mouse – there must have been 500 to choose from). Just amazing and the prices were keen too. Worried about eating and liquid intake. Forget it. Cologne has more pubs per capita than any other major city in Germany with a reputed 3,300 drinking establishments, clubs and restaurants. Whatever your tastes are there is something for you. And the beer is not too bad either. Our short visit did not take in the City Hall (though recommended). Nearby is the future Archaeological Zone with relics from Roman times, including a sewer and mikveh, the ritual Jewish bath. Completion is due next year. If flying is not for you the main train station is also in the city centre where there are small hotels and guest houses galore. Take in the spirit of the place. The locals have a smattering of English, or has a friend who learnt it at school and now follows the Premier League on TV.